A few words of poker wisdom, spoken by the legendary poker pros. "I never go looking for a sucker. I look for a Champion and make a sucker of of him." "It's hard work. Gambling. Playing poker. Don't let anyone tell you different. Think about what it's like sitting at a poker table with people whose only goal is to cut your throat, take your money, and leave you out back talking to yourself about what went wrong inside. That probably sounds harsh. But that's the way it is at the poker table. If you don't believe me, then you're the lamb that's going off to the slaughter." "When we play, we must realize, before anything else, that we are out to make money." "You call... gonna be all over, baby." "See, in my world - the world of high-stakes gin and poker - we play for cold, hard cash. It's all business, pure and simple. Anyone who thinks card playing is a 'game' - I'll show you a loser. Money... M-O-N-E-Y. That's how you measure success. One dollar at a time. One chip at a time. That's how you keep score." "I think that we are all in the right place at the right time almost every day. It's the people who are prepared to be lucky who can take advantage of being there. How do these people position themselves to be lucky? It was Goethe who said, 'Anytime that you take the first step toward trying to achieve something in life, all manner of good things will mysteriously fall into your path to help speed you along your way.' Amen to that!" "Try to decide how good your hand is at a given moment. Nothing else matters. Nothing!" "The two things you need to be successful in poker are, first, find the muck, and second, don’t play your own money." "No matter how much you may want to think of Holde×™m as a card game played by people, in many respects it is even more valid to think of it as a game about people that happens to be played with cards." "You can't let it get you down when somebody knocks you out of a tournament playing a hand they shouldn't have played. 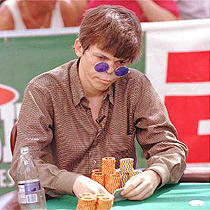 Without these types of players, nobody would win any amount of money, so sometimes you just have to take your medicine." "I guess if there weren't luck involved, I'd win every time." Get your Roland Garros tickets today and don't miss the action, thrill and excitement of one of the most important events in the world of tennis. Visit Paris, see the best tennis players live compete to win a Grand Slam title and be a part of history. You never know what tennis is really is until you see the best live in action, diving for every point.